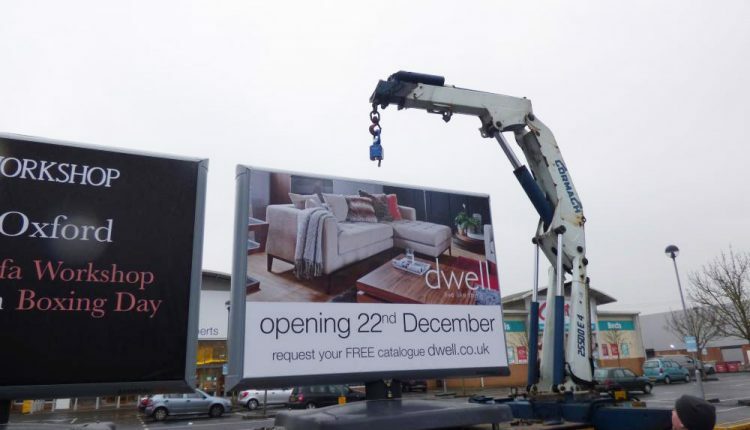 Trotter UK recently employed a fleet of trucks fitted with loader cranes and Elebia automatic hooks to place temporary advertisement billboards at construction sites, events, automotive forecourts, retail parks, and other locations. The Trotter billboard concept was devised in Holland; the company uses the patented Elebia evo5 hook equipped with a magnet that attracts and positions slings and other rigging gear. Each mobile billboard is fitted with a ring that enables safe and efficient lifting operation. Trotter UK has only needed a single evo5 to dat, but Southwell anticipates that it will have 120 billboards in stock by the end of the year so additional units may be needed. Trotter mobile billboards come in three sizes with the largest offering 2×8 square metres of advertising space, weighing 2.2 tonnes. Delivery and installation of a unit takes less than 20 minutes, largely owing to the employment of the Elebia hook. The billboards are placed on the ground not into it, and units can be in place for a one-day event or throughout a season or up to a 12-month period, depending on customer requirements.